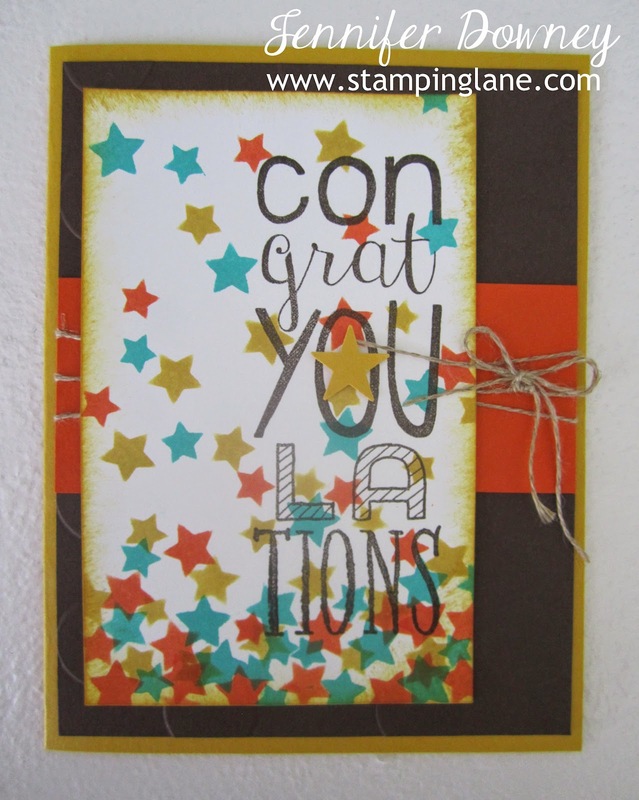 Stamping Lane: Creation Station Blog Hop - Confetti Creations! Creation Station Blog Hop - Confetti Creations! What fun choices this time! By process of elimination since Dotty Angles is on my "forever growing wish list" and I don't have Coaster Board, looks like we've automatically narrowed it down to confetti themed projects! This first card I took the concept of 'confetti' literally as you can see! Using my oh so fabulous Fringe Scissors, I made this colorful (Daffodil Delight, Pumpkin Pie, and Melon Mambo) confetti lickety split! All those little pieces are being contained in a shaker frame I created using a Window Sheet and our Dimensionals. Did you happen to notice the background behind the confetti? That was a super fun watercolor technique using an embossing folder I taught at my Downline Team Gathering last month. For this one, I used our Mosaic embossing folder. I kept the rest of the card rather simple, so the background and confetti were the main highlights. Love it when a card is interactive! For this next card, I took the concept of 'confetti' figuratively. In my mind I envisioned falling stars sprinkling down a card to simulate confetti. I thought my vision turned out pretty well, what do you think? How did I create these falling stars you may be wondering? I used our AWESOME, NEW Stars and Hearts Decorative Mask! Super easy and fun to use! I highlighted three of our new In Colors on this creation: Hello Honey, Lost Lagoon and Tangelo Twist. I LOVE the richness of these colors! And when you put them together it's a match made in heaven! I hope you enjoyed my confetti creations today! Depending on where you started on this blog hop, you can go back and revisit Kallan's creativity or you can hop along to see what wonderfulness Deborah has to share with you today! Happy Stamping! beautiful ideas! p.s.. your next doesn't go to the correct page! Very cute projects! Love the confetti made with the fringe scissors! Love your projects Jennifer! Great job! These are fantastic! I love a good shaker card - and your's is unique with that cool background! Great projects, Jennifer! I'm with you on lovin' the Hearts & Stars Masks - you rocked it!